Ohmagoddabl is Generator X's third outing. 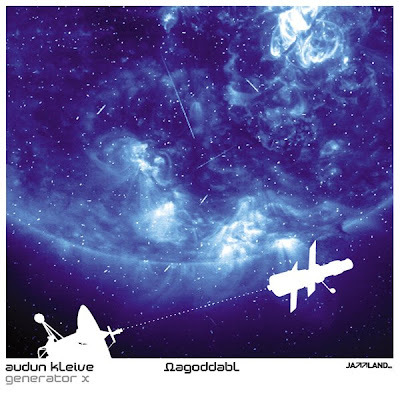 Audun Kleive's occasional group is made up of some of the cream of Norway's electric jazz players, namely Jan Bang (samples), Christian Wallumrod and Stale Storlokken (keys), and Arve Henriksen (trumpet). Ohmagoddabl's predecessor (simply entitled Generator X) was an intriguing, though occasionally patchy work; its spare moments were perhaps a little too spare, though they were balanced by some marvellous future jazz experiments, so this latest release is met with some anticipation. That Generator X's sound is so highly percussive is perhaps unsurprising given that Kleive is a drummer, but this motive power clearly harks back to Miles Davis's 1970s explorations as well as connecting to the rhythmic monomania of the electronic dance music revolution of the last 15 years. The first moments of "Genreactor" might be mistaken for a Carl Craig techno track except that bass stabs simultaneously signal a potential junglist anthem. Then clattering drums liable to cause clubland consternation start up, sounding like they're trying to lock into a pattern. Arve's trumpet discharges haunted moans and plangent appeals over some fine, phat bass while Audun continues to pursue the beat, but instead of repetitive groove, he delivers a kaleidoscopic matrix of rhythmic possibilities. Around the five minute mark things turn heavy and monstrous, murderous even. A minute later and it's all over, all too suddenly. "Exploded Cod" is thrash jungle complete with rubber keyboard bass. Ghost winds float over the melee like a dread fog. "Stumblin' At The Savoy" sounds like musical bricolage, as if anything that was within reach of the musicians had been grabbed and put into the service of rhythm. There's a precarious sense of parts travelling separately but towards a roughly similar destination. It's the musical equivalent of watching a Jean Tinguely sculpture negotiating its short lifespan towards an assured destruction. The pressure gradually increases to explosive levels until the ten minute mark when events turn into something like a junkyard symphony centred upon Kleive, who seems to excel at producing a grooveless groove. He's joined by all manner of squelches, squeals and electronic squwaking over which Storlokken's high pitched synths ­recognisable from Supersilent - soar like sci-fi comets.